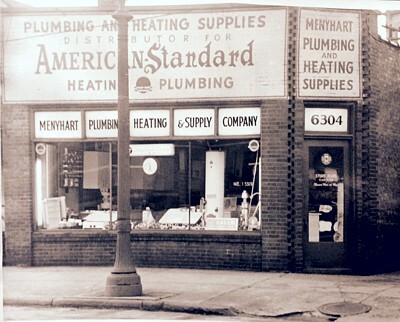 Alex and Elsie Menyhart started Menyhart Plumbing & Heating Supply Company in 1928. It was primarily a plumbing service company. Originally located at West 41st street, the company moved to its current location in 1941. At that time, Elsie and Alex lived in the back of the store until they built their house and moved to Brooklyn. As the company grew, it became one of the most active and respected plumbing service companies in the Greater Cleveland area. Their nephew Steve Menyhart joined the company in 1957 and began learning about plumbing from his Aunt and Uncle, who were both Master Plumbers. Steve helped to grow the parts department, which would become an extremely important part of the business. In 1976, Alex passed away and Elsie and Steve were left to continue the business. Some tough decisions had to be made. The most important change was to shift gears and exit the outside service business entirely and focus strictly on over-the-counter sales. The company continued to grow by increasing its repair parts, keeping prices competitive and offering expert advice through experiences accumulated from years of being "out in the field." This growth was also attributed to the high caliber of its sales associates who were committed to customer satisfaction. Menyhart Plumbing's reputation of stocking hard to find parts started to spread throughout the area. "If Menyhart Plumbing doesn't have it or can't get it, it's probably not available anymore" most people would say. Elsie and Steve along with their sales associates continued their challenging work of upholding their hard-earned reputation. Steve's son Peter joined the company in 1986 as the third generation to work in the business. Elsie successfully guided the company for a few more years and continued to work up until her passing in 1991. Moving into the 21st century, Menyhart Plumbing has been successful because of its hard-working and dedicated associates. One very important characteristic that hasn't changed throughout the years is the emphasis of maintaining a "family-type" atmosphere, which seems to be a dying breed these days. Because of this, more and more people have come to depend on Menyhart Plumbing for their plumbing and heating needs. Competitive prices, expert advice and good old fashion customer service have helped to build Menyhart Plumbing & Heating Supply into the company that it is today. This was the philosophy of Alex and Elsie back in 1928 and it still holds true today.